Sagah (second left) and others visiting one of the booths at the exhibition. SIBU: Oil palm industry players need to accelerate efforts in using mechanisation to reduce dependency on foreign labour. The estate sector also needs to implement measures to ensure accelerated reduction on use of foreign labour does not impede its daily operation, Deputy Chief Minister Datuk Amar Douglas Uggah Embas said. He pointed out that the oil palm industry in Sarawak especially the plantation sector was labour-intensive and highly dependent on foreign labour. “In 2016, the plantation sector employed a total of 115,000 workers who were engaged in various categories, of which 80 per cent were foreigners while locals made up 20 per cent which included those from the Peninsula and Sabah. The high reliance on foreign labour poses difficulties as the source of foreign labour will decline in the future,” he said. 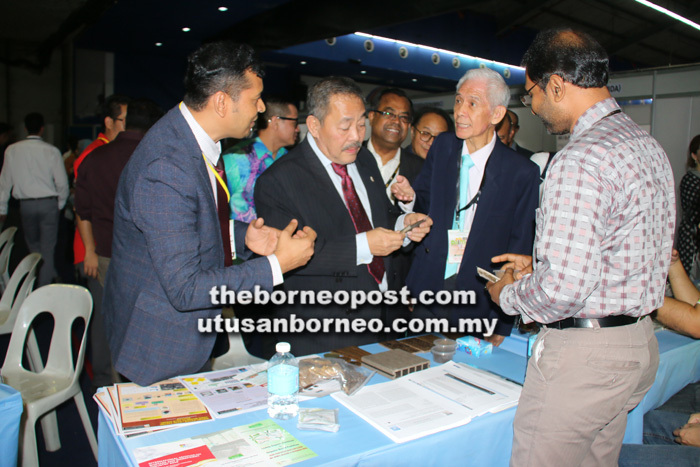 He was speaking at the opening of Malaysia International Palm Oil Conference 2018 and Sarawak International Biomass Expo 2018 at Sibu Trade and Exhibition Centre yesterday. The event was held in conjunction with Sarawak International Palm Oil Week (SIPOW) 2018. His text of speech was read by Assistant Minister of Native Land Development Datuk Roland Sagah Wee Inn. He said the government has introduced a number of measures, which includes mechanisation and training programmes to attract locals to work in the estates. “Given the lack of interest among local workers to work in the plantation sector and the difficulty in employing foreign workers in the near future, the way forward for the plantation industry is to accelerate efforts in adoption of mechanisation, at least in the estate operations such as in-field FFB evacuation. “I am optimistic that in the long run, mechanisation process will be a practical solution to reduce high dependency on foreign labour. A strong commitment by the top management is a prerequisite for a successful mechanization programme in the plantation sector,” he said. He added that the oil palm industry has provided the main source of livelihood of 48,887 landowners through government initiatives and some 36,787 individual smallholders throughout the state, and has played a significant role in the state’s objective of achieving high income society and uplifting the standard of living of its rural economy. He also said innovations are crucial to increase productivity, value-addition and sustainability targets and aspirations. On another issue, he said the oil palm industry needs to address the long-standing issue of sustainability, especially on the allegations and negative campaigns against the state oil palm industry by various non-governmental organisations and importing countries, particularly the European Union (EU). “This is important because the supply of sustainable palm oil by industry players, including independent smallholders, is very crucial in maintaining its competitive market position in the future, as palm oil contributes significantly to the social and economic development of the state,” he said. He also pointed out that the introduction of Malaysian Sustainable Palm Oil (MSPO) certification scheme by the government is therefore timely in order to address the issue of sustainability which involves compliance with international standards and environmental requirements. “The government has made MSPO certification scheme to be mandatory and has set the deadline for the industry to be certified. For the smallholders, the government has set Dec 31, 2019 for them to be certified,” he said. He also urged the industry players, scientists, agronomists and engineers to pool their expertise and resources together in their R&D and innovative ideas. Present at the event were chief executive officer of Fireworks Trade Media Kenny Yong and vice president of Malaysia Biomass Industries Confederation (MBIC) Ivan Ho Bee.